U.S. Presidents and sports have always been connected. Gerald Ford played football as a University of Michigan undergrad. George H.W. Bush played in the first two College World Series. George W. Bush was part owner of the Texas Rangers’ baseball franchise. Barack Obama frequently plays pickup basketball games with his staff (no doubt all terrified of accidentally hurting the Commander-in-Chief during the games.) Heck, Ronald Reagan even portrayed “The Gipper” in the football movie Knute Rockne, All American during his acting days. But only one U.S. President was ever a professional athlete, albeit for a very brief time. Evidence points to Dwight D. Eisenhower having played semi-pro minor league baseball in 1911 in Junction City, Kansas. Although for much of his life, this was something he chose to keep secret. Had he not in the first few years after he did this, it would have changed the course of American history. In 1911, baseball was really coming into its own in America. Stars like Walter Johnson, Christy Mathewson, Joe (not yet “Shoeless”) Jackson, and Ty Cobb, all future Hall of Famers, dominated major league baseball. The introduction of a livelier ball jumped started offenses. Frank Schulte had 21 home runs for the Chicago Cubs in 1911, the first time anyone had hit over twenty home runs individually in a season. Schulte and Cobb won the first Most Valuable Player Awards, receiving cars from Chalmers Automobiles as a reward from the sponsor. Attendance at baseball games rose across the country. Baseball had been popular since the late 19th century, but now professional teams began to pop up in every state, every city, every town in the country. This included the state of Kansas and Junction City. The period between 1909-1913 was “Kansas’ golden age in the professional game,” according to the Kansas State Historical Society. By 1910, twenty five cities and towns in Kansas had at least semi-pro teams playing organized ball. This included bigger Kansas cities like Wichita and Topeka with Class A minor league baseball teams (equivalent to Triple and Double A teams today). It also included smaller towns with Class D semi-pro teams (equivalent to the lowest level of the minor leagues today), like Abilene, Clay Center, Ellsworth, and Junction City. Junction City, called so because it was where the Wisconsin Valley Railroad intersected the Wisconsin Central tracks, actually wasn’t even its own village until June of 1911. Annexing itself from the nearby town of Carson, they held elections for officers in the village hall on the sixth of June. Twenty-three voters went to the polls that day and elected Jacob Skibba president of the village of Junction City. Despite not actually governing itself until 1911, Junction City had a baseball team in the Central Kansas League beginning in 1909. For the first two years of their existence, the Junction City Soldiers weren’t particularly good, never finishing higher than fifth in the league. As the 1911 season approached, the Soldiers, and all of the teams in the Central Kansas League, began to recruit new, young players. Needless to say, years later when the Central Kansas League came calling, Eisenhower couldn’t pass up the opportunity. The Eisenhower family didn’t have a lot of money, so both he and his brother, Edgar, had to take jobs to support themselves through school. They struck a deal not unlike the one later portrayed by the characters George and Harry Bailey in It’s a Wonderful Life (incidentally, Jimmy Stewart, who played George Bailey, in real life also became a General in the U.S. military). The Eisenhower brothers agreed that while one of them went to school, the other would work to pay for it. The next year, they switched. According to a 1969 Time Magazine article, Dwight worked at a creamery in 1909 as part of this deal. While there is no actual written documentation at the time, there is significant evidence that in 1911, at the age of 21, he found a new job twenty five miles east of Abilene with the Junction City Soldiers semi-pro baseball team. There was, in fact, a “Wilson” who played centerfield for the 1911 Junction City Soldiers, at least according to the definitive baseball archive Baseball Reference. This “Wilson” didn’t play very much, only appearing in nine games with 31 at-bats. He did have eleven hits though, good for a .355 batting average, and was perfect in the field with eleven chances and eleven putouts, for whatever that’s worth. I was a center fielder. I went into baseball deliberately to make money, and with no idea to make it a career. I wanted to go to college that fall, and we didn’t have much money. I took any job that offered me more money, because I needed money. But I wasn’t a very good center fielder, and didn’t do too well at that. In 1911 (possibly during the baseball season), Eisenhower was accepted into the prestigious West Point, readying himself to be in the Army and for his illustrious future ahead. When he arrived, he immediately tried out for the JV football and baseball teams. He made both. A baseball teammate of his was Omar Bradley, who also went on to become a famed World War II General. So how would any of this have changed American history? I mean, he played in a few semi-professional baseball games. Big deal. Here’s the thing. In order for one to participate in college athletics, one must be an amateur athlete, as in someone who has never made money playing sports. Playing semi-professional baseball, no matter if it was for love of the game or financial reasons, should have disqualified Eisenhower from making the football team. Yet, he told no one of his semi-pro past. Again, so what? He’d just get kicked off the team if they found out, right? Not quite. The Cadet’s Honor Code states “”A cadet will not lie, cheat, steal, or tolerate those who do.” While the Code didn’t get formally written until 1922 (with the impetus from then-Superintendent of the Academy Douglas MacArthur), it was still very much applied and honored. Today, Cadets have to sign such a pledge. It is not known if in 1911 West Point required an actual signature as well. Either way, an “officer’s word was his bond” and deliberate violation of this was a serious offense in the eyes of the school. If Dwight D. Eisenhower had been discovered to have lied about his lack of amateur status, he would have been not only kicked off the team, but kicked out of the Academy. History would have never had the great General Dwight D. Eisenhower, nor President Dwight D. Eisenhower, who is generally considered one of the top ten U.S. Presidents to date. If he had been found out while still in school, he would been kicked out and the world would have likely never known the name Dwight D. Eisenhower. A friend of mine and I went fishing and as we sat there in the warmth of a summer afternoon on a river bank we talked about what we wanted to do when we grew up. I told him I wanted to be a real major league baseball player, a genuine professional like Honus Wagner. My friend said that he’d like to be President of the United States. Neither of us got our wish. Eisenhower’s football career was actually cut short in a game against legend Jim Thorpe, who himself was just returning from his triumphant 1912 Olympics. With the future President’s team losing 27 to 6, Eisenhower was tackled at a bad angle and his knee buckled. He had to be carried off. Later that year, he hurt the same knee again in a horse riding accident. Eisenhower never played football again. Baseball Historian Bill Swank somewhat refutes that the team Eisenhower played for was the 1911 Junction City Soldiers. In August 2013, he presented his case at the Eisenhower Presidential Library saying that there is one known picture of the Junction City team with a player by the name of “Wilson” – Affie Wilson to be exact – and he looks nothing like Eisenhower. Then again, there are also several unnamed players in the picture, and while none of them look particularly like Eisenhower, this is also a picture that’s dated 1912, but supposedly of the 1911 team. In 1912, Eisenhower was at West Point so may have simply missed the photo shoot, and certainly at this stage would not have wanted any sort of public record that he had been on the 1911 team. On the website of the Eisenhower President Library, buried in the biographical section, it actually speaks of Eisenhower potentially playing professional baseball in 1913 as well, stating, “He returned to Abilene for the summer following his sophomore or ‘Yearling’ term at West Point in 1913, when he may or may have not played semi-professional baseball.” By 1913, it wouldn’t have mattered all that much. His football career was done due to the knee injury and baseball wasn’t in the cards for him at West Point. He wasn’t playing amateur sports any longer, so his eligibility wouldn’t have been compromised by taking a summer job playing baseball, and he wouldn’t have had to lie about it. I really enjoy all of your articles, but do have one question about this one. If an athlete plays a professional sport, it only precludes them from playing that one sport in college. Or, at least those are the NCAA rules today. They could have changed since Eisenhower was young. If the rules have remained the same, Eisenhower wouldn’t have had any real reason to lie about playing professional baseball. He wouldn’t have been eligible to try out for varsity baseball and wouldn’t have experienced that crushing failure to make the team. He would’ve been able to play football and still be the star he was in that sport. And he could’ve avoided having that lie on his conscience his whole life. Provided the NCAA rules weren’t different back then. There are several modern day cases of guys who played professional baseball and returned to college to play football (and do very well at it). One was the star quarterback for my favorite college team: Chris Weinke. Just some food for thought. 🙂 Keep up the excellent work. I look forward to my daily bits of random facts! A friend made me aware of your recent baseball article about President Dwight Eisenhower. I just returned tonight from a fact-finding mission to Skagway, Alaska to locate the site of that town’s 1910 base ball diamond. I am indebted to the fine work of local historians Cathy and Robert Spude. I’m sure you agree that before an article gets published, it is important to review the facts. I am embarrassed to learn that, in your opinion, my research only “somewhat refutes” the notion that young Eisenhower played for the 1911 Junction City Soldiers. I apologize that my feeble communication skills failed so miserably to convey the numerous discrepancies, wrong assumptions, poor research and erroneous conclusions contained in the so-called “Eisenhower Baseball Controversy” about Ike allegedly playing pro ball before he entered West Point. I applaud reader Stephanie R. who correctly understands that NCAA eligibility rules are subject to change. In the first place, the NCAA did not exist in 1911. Secondly, “amateurism” was not even defined by the NCAA until the 1920s, long after Eisenhower had graduated from the Military Academy. There is insufficient room in your comment section to prove that Dwight Eisenhower did not play for Junction City. Furthermore, “Affie” Wilson definitely was not Dwight Eisenhower. In closing, it is much easier to prove something happened than to provide it did not happen. Your biography notes that you are a comedian. You will be pleased to know that your article made me laugh. I don’t know about anyone else, but I’m interested in the explanation and proof. Your above comment is long enough, why not include some of that proof in another so we can get both sides of the story? Thanks for your interest in President Eisenhower’s baseball career. Below is an essay on the subject I apologize for the length which hopefully doesn’t violated internet protocol. The Dukes of Wellington are dead. The El Dorado Crushers crushed. The mighty Newton Railroaders, the Larned Wheat Kings, the Concordia Travelers… long gone. Minor league baseball, once so popular in small towns throughout the Jayhawk State, starved, withered and blew away. Dust in the wind. In 1909, Abilene acquired a new professional baseball team in the Central Kansas League. Its nickname was the Reds. The following year, the Reds became the Red Sox. By 1911, the team was gone. 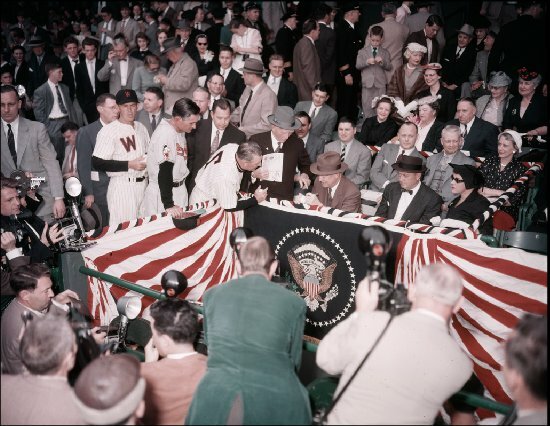 Dwight Eisenhower loved baseball. He played for the Abilene High School baseball team and graduated in 1909. In June 1945, following three-and-a-half years of war and the unconditional surrender of Nazi Germany, Supreme Allied Commander General Dwight D. Eisenhower returned to America. He was honored with a hero’s ticker-tape parade down Broadway, but the only thing Ike wanted to do in New York was to see a major league baseball game. The Boston Braves were in town to play the Giants at the Polo Grounds. During pregame workouts, the general spoke casually with Giants manager Mel Ott and Braves skipper Bob Coleman. Accounts of their conversation appeared in The New York Times, Wichita Eagle and Life magazine. Eisenhower shared a secret. Prior to West Point, he played professional baseball in Kansas under the assumed name of Wilson. Then he clammed up. Bill Stern was a popular and respected sportscaster from the 1920s into the 1950s. An inaugural member of the American Sportscasters Hall of Fame, the following fantastic tale appeared in his 1946 book titled, My Favorite Sports Stories. Stern based this fantasy on the general’s offhand comments in 1945 and two stat lines for “Wilson” from the 1912 Official Baseball Guide. To keep the record straight, Affie Wilson – a real person – only played nine games for the 1911 Junction City Soldiers. Stern couldn’t even get that right. Over the years, there have been numerous variations of this story. The following excerpt from Carlisle vs. Army: Jim Thorpe, Dwight Eisenhower, Pop Warner (2007) by Lars Anderson is a similar example of eloquence and flowery fiction. “The blond-haired, blue-eyed young man roamed center field with quickness and determination, zeroing in on fly balls like a bee to a springtime flower. At the plate he did not possess as much power as his thick build would suggest, but he was a good contact hitter. Once he reached base, he tormented pitchers by always threatening to steal. But what most distinguished the player everyone called ‘Wilson’ was his passion for the game. He may not have had Big League talent, but he certainly possessed the doggedness of an all-star. It was the beginning of summer in 1909, and Dwight Eisenhower was trying to make a little extra money. Shortly after graduating from Abilene High, Ike reported to the local minor league team that played in the Central Kansas League. Not wanting to take any chances, Eisenhower told his manager that his name was Wilson. Ike had just become reacquainted with his old friend Swede Hazlett, and Swede was egging him on to apply to the Naval Academy in Annapolis or the Military Academy at West Point. At this point in his life, Eisenhower was still deciding where he wanted to go to school, but if he made it into either of the academies, like all incoming cadets and midshipmen, he would have to sign an NCAA eligibility card that included fifteen questions about whether or not he had ever played professional sports. Eisenhower desperately wanted to be a football player and a baseball player when he reached college, and if he went to either Army or Navy, he fully intended to sign that card. But if it were ever revealed that he earned money while playing professional sports, he would be in violation of the Honor Code at those schools and could be expelled, ending a potential career in the military even before it began. A wheat field of dreams would be more like it. Was Lars Anderson writing about Shoeless Joe Jackson in Iowa or Dwight David Eisenhower in Kansas? Player/manager Affie Wilson “went 63 for 219 (a .288 batting average), scored 43 runs, stole 20 bases” for the 1909 Abilene Red Sox. Like Bill Stern, Anderson borrowed Affie’s stats for his book, but failed to mention he played for Abilene. A reasonable person would wonder how Eisenhower could possibly pass himself off as somebody named “Wilson” in his own hometown. Who was Affie Wilson? From 1909 through 1914, the angular outfielder was an established star in both the Class D Central Kansas League and the Class D Kansas State League. Stern and Anderson found him in the record books and transformed him into Dwight Eisenhower. Others followed with their own embellishments and controversy ensued. The later stories emphasize that Eisenhower entered West Point and lied about being a professional baseball player. Seemingly, such an admission would have made him ineligible to play varsity football at West Point, but historic perspective and the truth can be elusive. Understanding morality from another era is never easy. Complex issues cannot be resolved with simple explanations and people tend to mistakenly judge the past by today’s standards. Professionalism and semi-professionalism almost ruined collegiate baseball in the early 20th century. The use of assumed names was commonplace. Several respected members of the Baseball Hall of Fame including Eddie Collins, Lou Gehrig, Yogi Berra, Larry Doby and Monte Irvin all hid their identity. Universities and conferences purposely enacted cryptic guidelines or simply winked just to keep college baseball alive. The Intercollegiate Athletic Association of the United State was created in 1906. The name was changed to the National Collegiate Athletic Association in 1910. Its scope and authority were limited because most of the prestigious Eastern schools did not become members until many years later. Captain Palmer Pierce of West Point was the first president of the IAAUS (NCAA). Excluding military service during World War I, he served with distinction in that capacity for over 20 years. Pierce held strong opinions against professionalism in collegiate sports, but professionalism meant something entirely different a century ago. “Youthful infractions” was a large eraser on the end of the scorekeeper’s pencil. College athletes were required to complete a detailed eligibility card that included specific questions about participation in professional competition. Being an honorable young man, let us assume Ike admitted he played a few games for money under an assumed name. That would have been considered a “youthful infraction.” Eisenhower would have been allowed to compete athletically and would not have been in violation of the cadet honor code. If you consider this a generous assumption, why did the highly principled Palmer Pierce allow Army to recycle players who had already graduated from other institutions? Several subsections of the original NCAA bylaws specifically prohibited this practice. Charles Daly was a quarterback at Harvard. He graduated in 1901, moved on to play four years of football at the Military Academy and graduated from West Point in 1905. Daly was the Army coach when Ike played football in 1912. Elmer Oliphant earned seven varsity letters at Purdue and graduated in 1914. He went on to earn an additional eleven varsity letters at Army (1914-1918) starring on the baseball, basketball, football and track teams. Were these men “professional” student-athletes? It is important to note that the NCAA did not even define “amateurism” in its bylaws until 1916. Second Lieutenant Dwight Eisenhower had already graduated from West Point in 1915. The International Olympic Committee stripped Jim Thorpe of the two gold medals he won in 1912 because he had played professional baseball in 1909 and 1910. Since there were no similar NCAA rules, he was allowed to play collegiate football that same year. In 1912, Thorpe and the Carlisle Indians beat Army and Dwight Eisenhower, 27-6. Ike said one of the biggest disappointments of his life was not playing baseball on the Army team. People assume that implies he was not good enough to make the varsity, but other factors were involved. As a plebe, Point baseball coach Sammy Strang told Eisenhower that if he learned to swing through the ball rather than slapping it, there would be a spot on the varsity for him. One hundred years ago, the art of batting was slowly evolving from contact to power. A promising halfback on the Cadets football team, Eisenhower injured his knee on the gridiron in his sophomore year. In 1913, the knee was reinjured during a mounted gymnastics exercise known as “the monkey drill.” There was concern he would be unable to remain at West Point. In the end, the injury precluded him from further participation in intercollegiate athletics. Records reconstructed from Abilene newspapers articles about the 1909 Abilene High School baseball season reveal Dwight Eisenhower was the team’s leading batsman (.241). AHS won 7 games and lost 2 that year and one of those losses was to the University of Kansas freshman team. Three of his high school teammates went on to play Class D baseball. Surely the best hitter on the team would have been good enough to play a few games of minor league ball and varsity baseball at the Academy. Ike didn’t claim to be a star. By his own admission, he did not do well as a “professional.” Self-promotion and boastful talk were not his style. But, even as a young man, there were clues to an expedient and political side of his personality. Ike returned to Abilene High School in the fall of 1910 to study for his West Point exams. He took this opportunity, two years after his graduation, to again play football on the high school team. Although all of the 1910 Abilene newspaper articles about football refer to him as Eisenhower, there is a possibility other schools thought his name was Sweeney. Neither Eisenhower nor Sweeney are mentioned in “local towns” Chapman, Enterprise and Salina newspaper accounts of games against Abilene. Eisenhower is listed as left tackle for Abilene in the Russell newspaper. Russell, Kansas is 90 miles west of Abilene. It is through Eisenhower himself that we learn he played both professional baseball and post-graduate high school football under assumed names before he entered West Point. He did not explain the details because they were “too complicated.” He made them complicated… but not unusual for the era. Significantly, our 34th president neither violated the cadet honor code at West Point nor existing NCAA rules. He was not involved in a baseball scandal or cover-up. The Eisenhower baseball controversy ensued because the subject matter, inadequately researched, is defined by modern morality. It is naive to presume that a general or president would not or should not understand and practice then art of deception. In conclusion, after an extensive review of articles in old newspapers from the small towns and villages of the Kansas State and Central Kansas leagues, Wilson could not be found in center field. But just because he wasn’t at the bat or in the box score, doesn’t mean he did not exist. Perhaps his ghost is still out there chasing fly balls among the sunflowers and wheat fields of Kansas. One thing is certain. It is much more difficult to prove that something did not happen than it is to prove it did.